A vinyl enthusiasts' inside man, Dante Carfagna has made his name as one of the world’s leading authorities on rare groove. An absolute fixture on the scene, it's a safe bet that Carfagna has had something to do with most prominent soul/funk compilations in the last decade. Moving quietly in heavyweight circles alongside notorious diggers like Cut Chemist and DJ Shadow (with whom he's toured and DJed with at Brainfeeze and Product Placement events), he's not to be underestimated as a recording artist. My introduction to Carfagna's work was through his production. Recording under the name Express Rising, he released his self-titled debut in 2003 on Memphix, a label which he co-founded and prided itself on very limited run 7''s. One of the most beautifully produced albums of the last decade, Express Rising was a haunting, lo-fi instrumental hip-hop piece four years in the making. Much like it's Memphix counterparts, Express Rising has garnered a large cult following since it's release. Existing copies are scarce and have been spotted on eBay on upwards of $100 dollars. Much like the records he's spent his life searching for, his very own releases have sparked a hunt for a new generation. But trust that when you finally find a copy, it'll be worth it. Most recently his book, "See Label For Contents: A Survey of 45 RPM Label Art in America 1955-1980", written and compiled with Josh Davis (DJ Shadow), surveys the art of the 45 RPM record label in the U.S., choosing to highlight the arcane, imaginative, befuddling and often hilarious graphics found on the thousands of locally produced records released during the format’s heyday. Themed chapters include "Civic Pride", "Animals", "Space", "Horror", "Egregious Typos", "Native Americans", "Proto-Graffiti", "Fauna", and "Transportation". No release date has been placed. 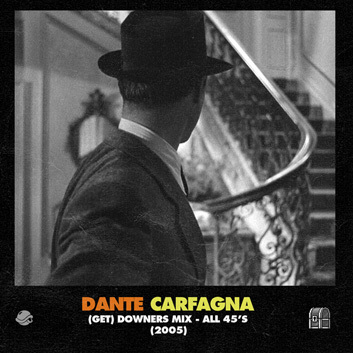 One of the most requested archives, we're happy to (re)present Dante Carfagna's "(Get)Downers Mix" live on Andrew Meza's BTS Radio.